Owned and hosted by Pieter Grobbelaar, this guesthouse is close to the major highways and central to Pretoria, Krugersdorp, Midrand, Soweto, Johannesburg and Centurion. 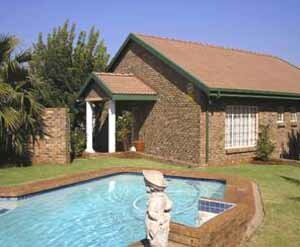 Guest house accommodation includes breakfast and supper can be arranged on request. Room facilities: Twin ¾ bed units with own bathroom, hairdryer and coffee/tea facilities and TV.